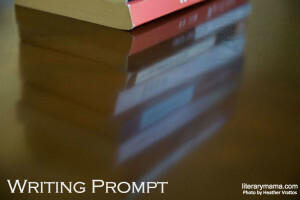 Last month, we invited readers to share their responses to a writing prompt inspired by Dara Barnat's essay, Poetry or Prose: Writing and Motherhood. We asked readers to tell us about an event that caused them to make a shift in their writing. Below is Ann Klotz's response. I kept a journal throughout adolescence into adulthood—musing, meditating, working out how I felt, adding bits of stories or poems. A wise, English teacher had greeted me at the beginning of tenth grade with a black and white composition book and said, “Write how you feel. Whatever you want. And I will write you back.” My older brother had died in a car accident late that summer. I was 14 and full of grief. In those long ago days of the mid-1970s, going to therapy wasn’t yet what people did—at least not where I grew up. So, I began to write with a cartridge pen on the clean, white, non-judgmental pages of the composition books that, by the time I finished high school, filled the shelves of my shag-carpeted bedroom. Writing, I learned, could help me shape my grief and look at it. On the page, it seemed possible to tame my loss. I wrote every day. I grew up, became an English teacher, a drama teacher. I helped girls claim their voices. Then, infertility and years of yearning. After my first miscarriage at 14 weeks, I stopped writing. Cold. I wrote, of course, for my job: letters and handouts for my English class and recommendations, but I stopped writing for me. I amputated my daily practice, my comfort. Was I punishing myself because my body had failed me? Did I choose to cut myself off from the solace words had offered for so long? Was I simply not able to confront my sorrow and rage and inadequacy? All of the above. I told no one I had stopped writing. As the losses multiplied, I fell out of practice. I stopped thinking of myself as a writer. Five miscarriages and three children later, I had not found my way back to my words. The remarkable poet, Naomi Shihab Nye, visited my school one April. A little girl asked why grownups don’t do what they want to do. Naomi answered that grownups have a way of talking themselves out of what they most want to do. I went home and dug out a small notebook—less pressure than the large ones of my girlhood—and found a pencil—less pressure than pen. Following Naomi’s counsel, I wrote three things—just three. Like that, my words returned. I had not realized how much I had missed putting words down on paper until they came back again. Now, once the dogs and cats and goldfish have been fed, once the dishwasher has been emptied, and the coffee poured, I head to our little den and write. I write for me. Taking this time, committing to this practice feels like the only consistent self-care ritual in my life. I cherish it. I do it because it makes me happy. Grief gave me a stream of language and grief stopped my outpouring. Punishing myself by not writing did not give me my children. They came. Now, making up for all those years I didn’t write about them, I do. I remember and record. Ann V. Klotz is a writer, teacher, and mom who lives in Shaker Heights, Ohio, where she is Head of Laurel School. Her work has appeared in Literary Mama, Mothers Always Write, Mamalode, Brevity's Nonfiction Blog, the Manifest-Station, and Feminine Collective. You can read her work at www.annvklotz.com. Beautiful, Ann! Brings tears to my eyes and words to my pen! Thank you!! Thank you, Kathryn! That means the world to me.